Hello, readers! Here I am again after taking a week’s break from the Thursday Thrift. The weather just went straight to warm. It was a partly sunny day with a high almost in the 80’s. A perfect day for polka dots, a little bit of flowers, and orange! I am fulfilling my bright clothing requirement for the day with an orange top. I really think I like orange more than I like yellow. It is such a pretty color! 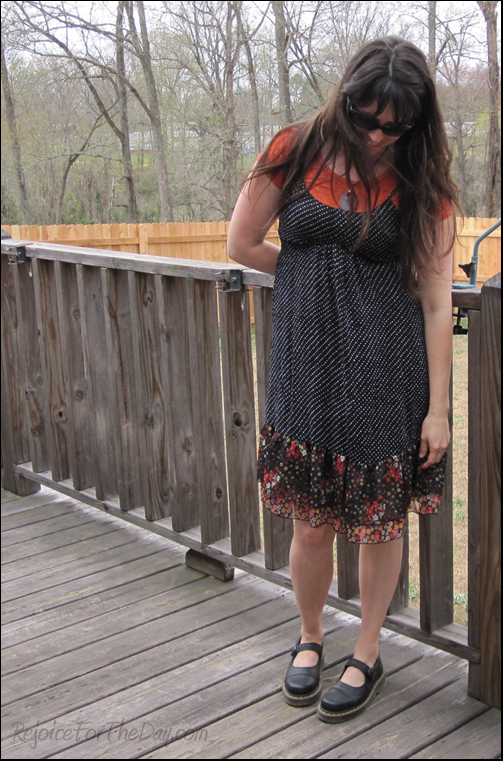 The top was not thrifted though, just a good deal from Kohl’s – I love that store. 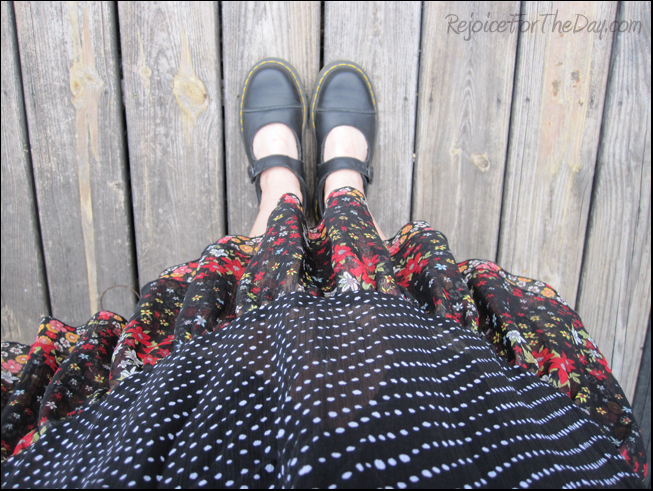 So, for this week, a thrifted dress and a new-for-used-price pair of Doc Martens from ebay – I love that place as well! Hopefully the weather is warming up where you are, and some of the sundresses and warmer weather clothes are starting to come out from hiding. Although, I tend to wear sundresses year round, only with tights and sweaters, it is nice not to have to bother with those. How is the weather for you? Is it spring yet? **The kind folks over at Kohls.com have given me a 10% off, online code for me to share with my readers. (Perhaps you are like me, and think they have great buys on staple items, such as everyday orange t-shirts!) This code is good for online purchases until May 10th: BLOGS10. I love the tee layered under the dress! Great look! Thank you! I tend to always go with a tee under the dress look, so glad to know it doesn’t look that bad. Target does have some great dresses! I find a lot of their stuff at my local Goodwill, and a lot of it is still new with tags. Bonus to find new items at thrift store prices! Love this dress, it is so pretty! Thanks! I LOVE polka dots and really liked the way they looked with the floral pattern. The style of the dress passes so well with your shoes and this long, loose hair. I like it.